Pharyngitis is an inflammation of the pharynx, which results in a sore throat. Inflammation may result from a number of causes. These may include environmental allergies, food sensitivity or bacterial or viral infections. Common accompanying symptoms might include coughing, fever, fatigue or body aches. Teas can help ease sore throats; however, you should discuss your symptoms with a medical practitioner before relying on teas as a cure. 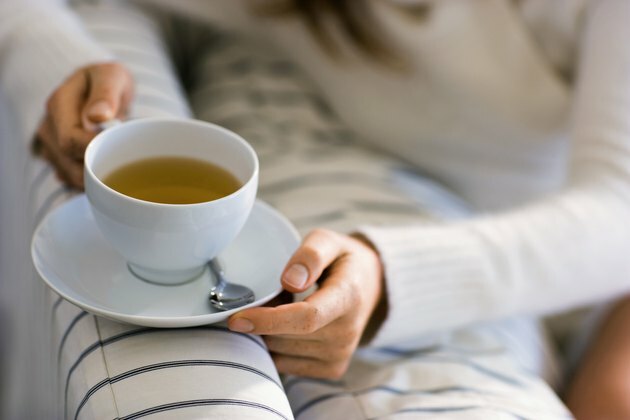 Herbal teas may soothe a sore throat in one of three ways: The herbs might contain a type of mucilage that coats the mucus membranes and expedites the healing process, possess anti-inflammatory properties or enhance the immune system. Herbs such as licorice root, eucalyptus, slippery elm, peppermint and marshmallow root may be effective at treating sore throats, according to the University of Maryland Medical Center. Peppermint contains menthol, an active ingredient that functions as a decongestant and expectorant. A variety of spiced teas contain potent antibacterial, antifungal and mucus-loosening components, all of which help to soothe troublesome sore throats, according to the UCLA History and Special Collections Department of the Louise M. Darling Biomedical Library. Recommended spices include cinnamon, ginger root, cloves and garlic. Simmering grated or whole cinnamon bark, peeled and sliced ginger root, or crushed cloves and garlic creates an aromatic spiced tea that is soothing not only to the senses, but also to a sore throat. Traditional teas are derived from the Camellia Sinensis plant, according to the Tea Information Centre, and include common household teas such as black tea, white tea, green tea, pu-erh tea and oolong tea. Tea manufacturers often combine a variety of traditional teas together to create a blend such as Irish Breakfast or Earl Grey. According to the Tea Information Centre, many traditional teas contain powerful antioxidants that support a healthy immune system. Teas may be infused with natural sweeteners for added health benefits. Honey and citrus are common ingredients that not only flavor tea, but also might have medicinal benefits. For example, honey may help reduce inflammation in the throat, and citrus fruits such as lemon and orange are rich sources of immune-boosting vitamin C.
If you take medication, talk with your doctor before you drink herbal or medicinal teas. Some herbs and supplements found in teas can reduce the effectiveness of your medication or result in serious side effects. Does Tea Help a Sore Throat?